I try and take good care of all my things. Clothes, cars, cookware, whatever…if it belongs to me, it’s my responsibility to properly maintain it. One glaring exception to this rule has been my wooden cooking utensils. I’m one of those people who knows better but throws the wooden spatulas, spoons, and cutting boards into the dishwasher anyway. I’m also one of those people who has some gnarly, dried out wooden spatulas, spoons, and cutting boards. And then, thanks to a series of links I can no longer reconstruct, I landed over at 3191 Miles Apart‘s post about Wood Butter. Actually, I landed on their post about Spoon Oil but I like the name Wood Butter better. Within moments of reading the post, I was burning up Twitter, the Googley, and eBay trying to find a source of pure beeswax that could arrive via overnight express. Because, dear friends, I was on a rescue mission. I was determined to save my long neglected wooden utensils. Thanks to eBay, PayPal, and the USPS, I was soon in possession of four ounces of sunshine. That’s the only way I can describe the smell of pure beeswax. Sweet and warm with just a hint of green. Heady stuff to be sure. Wax was melted, mineral oil was heated, and the two were introduced to the inside of a quart Ball jar. After stirring and cooling, it was time to get down to business. I soon learned less is more when working with wood butter because a little goes a lot farther than I had expected. Spoons, spatulas, and board received a Wood Butter massage and were set aside to rest and relax. A day later, excess Wood Butter was buffed away with a clean dish towel and the utensils were put back in the drawer. Now, when I open that drawer, I’m not greeted by the gnarly shrieks of dried out spoons and spatulas. Instead, I could swear I hear contented sighs and get the faintest whiff of sunshine. Want to experience the miraculous powers of Wood Butter? You’re in luck. Since my stash of Wood Butter far exceeds my wooden utensils inventory, I’m going to give some away. To enter, leave a comment below confessing whether you too are guilty of crimes against your wooden utensils. Entries must be received by midnight on April 30th. The randomly selected winner will be announced on May 1st. Want to make your own Wood Butter? Keep reading. BAH Note: If you have a great farmer’s market, check there for a source of local pure beeswax. Since I did my searching in February, I had better luck over on eBay. Mineral oil can be found at the drug store or supermarket near the laxatives. If you want to scale down the size of your batch of Wood Butter, use a 4:1 ratio – four ounces of mineral oil to each ounce of beeswax. My wax came in individual one ounce bars. If yours is larger you may want to break it into smaller chunks. Bring a saucepan of water to a gentle boil. 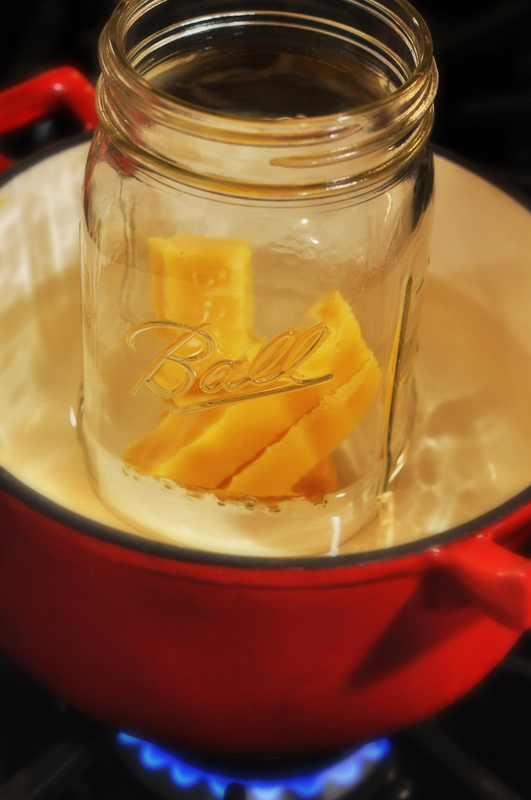 Place your beeswax inside a one quart glass jar and set the jar in the simmering water. While the wax is melting, place the mineral oil inside another large glass jar. Once all the wax has melted, carefully remove the jar from the saucepan and set it aside making sure to place a dish towel or pot holder under the bottom of the jar before setting it down. Set the jar of mineral oil into the simmering water until it has warmed a bit. Carefully remove the jar of mineral oil from the pan and pour the oil into the melted wax. Stir with a wooden skewer until the two are thoroughly combined and allow to cool completely. The final product will thicken and turn opaque. Seal your jar tightly with a lid. What a cool giveaway! I confess! I am also a wood utensil neglector. I bet this stuff would make good lip balm too. i did neglect a wood cutting board once… and what i mean by that is, it was the ex’s and i let him be an idiot about it. i told him not to put in the dishwasher and he didn’t listen to me. the board did not belong to me but i saw its abuse and did nothing. i have shied away from owning any wood utensils since…. mayhap that will change should i get around to making wood butter. I don’t need to be in the entry, because I can already attest to the wood butter’s awesomeness–because you’ve already shared it with me! Much easier to work with than straight up mineral oil (which is what I used before). Wood butter? Who knew? What a cool thing! Yeah… who would’a thought huh. Brilliant, thanks for sharing Wendi. Guilty 😦 We have a crappy wooden cutting board from Target that is 3 strips of wood glued together. It only took a few cycles in the dishmonster to turn it into 2 strips of wood. Love the blog, we just moved to Charles Village from Cockeysville. Looking forward to the farmers market(s). Brilliant! I had no idea that kind of damage was reversible. =) I can’t commit the dishwasher crime against my wooden stuff because I have no dishwasher (some day …). However, there’s this wooden spatula I use ALL the time (it’s in practically all of my step by step recipe pictures =) and it could use a little spa treatment. You are speaking to me! I am guilty of this heinous crime, even with my olive wood utensils…. I walk the kitchen galley of shame… Save me, oh Wood Butter!! Wood butter, huh? I had no idea such a thing existed. My wood utensils could really use some! My wooden utensils hit the dishwasher a little too often. I think I hear them begging for some Wood Butter now! Very interesting, Wendi. My wooden spoons are ok, probably because I always forget I have a dishwasher. So no need to enter me in the contest. But I’ll keep this idea in mind for the future. I started channeling my inner Oprah when it came time to select the winner of the wood butter giveaway. There was this voice in my head yelling, “You get wood butter! And YOU get wood butter! AND YOU GET WOOD BUTTER!!!”. So when the HRH speaks to you, you listen. I will be making up wood butter samples for everyone who provided an email address in the comment they left up to the April 30th cutoff. Pingback: Wood Butter – The perfect thing for your wood bowls and utensils. — A Denver Colorado Food Blog - Sharing food through recipes and photography.